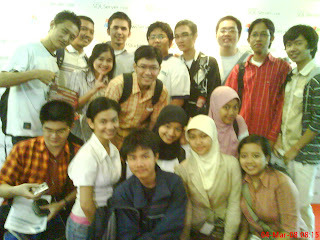 Yesterday, me n most of IT friends went to JCC to attend the grand launching of Windows Server Wave 2008. We came so early for our grand noble motive, to get free a book, and other free goods ^^. Even though it was early (half past seven), the queue was longggg -_-" but miraculously, we didn't need to queue! That's because we came from the backdoor, through the inside of JCC!! Hahaha, what a favor we got. So, without queuing, we went registered at the front to get the numbered feedback form. Then, we gather the ITers and do a morning photo session. We went around the hall collecting some feedback forms for souvenirs, while looking for the free book and more free stuffs. At 9, in the Plenary Hall, the launch began. The ceremony started with a wonderful Kecak Dance with effects, opening speech, and demo of the new virtualization technology. 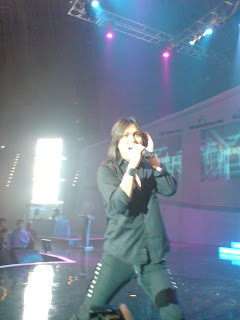 At the end, Dewa 19 performed. Though attended by IT geeks, Dewa has surely lots of fans. The session after lunch is allocated to attend some talk, given by Microsoft professionals. Visual Studio Team System, Windows Server Core & Powershell, Silverlight + AJAX are the talks I attended, while getting some free CDs, magazines, pens, bags, and other merchandises. Well done, mission accomplished, we went home with a handful of free souvenirs ^^ thanks to Microsoft and partners.